Many people experience back pain, sometimes this type of pain is due to a disc injury. It can be hard to function or lead a normal lifestyle if you suffer from a disc injury. Chiropractors are experienced in helping people with disc injuries, in addition to other type of back pain issues. 1. A disc “bulge” is one type of injury. It occurs from slight tears in the fibers of an annulus fibrosis, which contains a gel-like substance. This substance is known as the nucleus pulposis. These types of tears can be very painful thus making it hard for someone to lead a healthy lifestyle. 2. A disc “protrusion or herniation” is another type of injury. It occurs when the annulus fibers become completely torn. In addition, this type of injury is a more significant injury and can be extremely painful. 3. One of the most common disc injuries is a disease called “degenerative disc disease”, it occurs when the nucleus loses water and small tears appear within it. The body can form bone spurs along the vertebrae due to this particular disease. 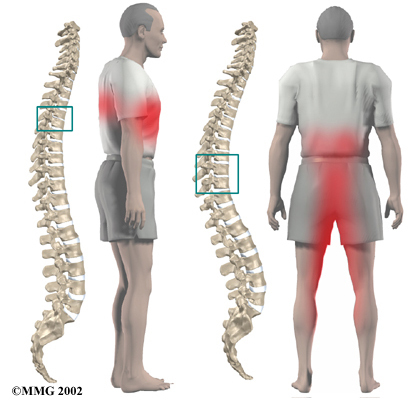 A person can feel pain along their spine, in their legs and in their arms when they experience any kind of disc injury. However, many disc injuries can be treated without surgery or medication by seeking help from a Chiropractor. A Chiropractor will treat every patient who experiences a disc injury or back pain on an individual basis. 1. By using physical modalities thus controlling the pain. 2. Using heat or cold to help control pain. The key is to get you back on your feet as fast as possible so you can get back to doing all the things you love to do without dealing with pain constantly. If you are experiencing back pain, please contact Hoffman Chiropractic, we are here to help you with all your back pain and disc injury issues. Call 815-937-0446 or visit our website and experience a life without constant pain.